1) We mean to build our racial religious movement legally and constitutionally by employing and enjoying the same rights as does every other religious group in the world, by means of propaganda, by means of persuasion, by means of organization. Our religion is based on Racial Loyalty. There is nothing new about Racial Loyalty. If you look at the real world around you, you will see that the negroes practice it, the Jews practice it, the Indians practice it, the Muslims practice it, the Japanese practice Racial Loyalty. In fact, just about every race in the world practices Racial Loyalty and has for thousands of years. The only difference is that we are now talking about White Racial Loyalty. But there is nothing illegal about being White and there is nothing Illegal about White Racial Loyalty. 2) We plan to build our movement to such dimensions that we will be able to take control of our government from out of the hands of the Jews who now have it and thereby take control of our own destiny. Nothing illegal about that. After all, the White people built this great country. What is more fair and more legal than the White people having control of their own destiny, rather than a small minority of Talmudic Jews ? How do we plan to accomplish this ? 3) We plan to accomplish it by promoting Racial Loyalty to the White Race, by informing, arousing, uniting and organizing the mighty potential of our White Racial Comrades. We mean to polarize the White Race under Creativity and build one mighty powerhouse so that we, not the Jews, will be in charge of our own affairs. Nothing illegal about that. 4) Having done the above, we will then further practice Racial Loyalty and take our next step. In accordance with Nos. 6, 7, 8 and 9 of our Sixteen Commandments, we will boycott the Jews. We will boycott them in business and break them financially. We will boycott them in politics and drive them from out of government. We will boycott them in education, in the news media, and every other place in our cultural life. There is nothing illegal about using the boycott either. The Jews have been doing it for thousands of years. The Arabs have been boycotting Israel for the last ninety years. The American government (JOG) has been using sanctions (an extreme form of boycott) against South Africa, against Iraq, against Iran, against Germany in the 1930’s and against any and every other country they didn’t like. Numerous Jew controlled organizations even today use the boycott, so we can conclude there is nothing illegal about using the boycott. However, if used by a united, polarized White Race, believe me, it can be and will be extremely effective. 5) Having achieved control of our own destiny, we will then simultaneously stop subsidizing the negroes in this country, stop subsidizing the parasitic state of Israel, and in fact, stop subsidizing all the other 120 some countries that JOG has piled on the backs of the working White taxpayers. We will simply let all these Jews, negroes, parasites and freeloaders shift for themselves and wither on the vine. Having done the above, we will let Nature take its inevitable course in phasing out the problem. For hundreds of millions of years Nature has followed its wise but ruthless course of Survival of the Fittest, which also means the demise of those unfit to cope for themselves. In the endless struggle of each species to survive in competition to other like species, Nature has persistently used the culling process, of weeding out of the weak, the deformed, the sickly and the mentally incompetent. It is only in the last half of the 20th century that the White Race, misguided by the hand of the Jew, has subverted this purgative action of cleansing the genetic defects of a species gene pool. By subsidizing the lazy, the shiftless, the incompetent and rendering massive aid to all the parasites, the scum and the free-loaders of the world, we have greatly multiplied the defectives at the expense of the competent, until now we are reaching the breaking point. In our programme we mean to reverse this sick and idiotic process. All this, too, is strictly legal. 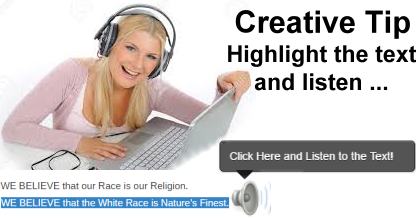 6) We are now well on the way towards the salvation and redemption of the great White Race. Our next step is to then aggressively cleanse our territory of the still lingering dark races. The first step is to forcibly expel the millions of illegal aliens. This too, is strictly legal, and it is a dereliction of duty that our JOG government has not done so a long time ago. Along with these illegal negroes, we will also expel all other alien dark races – Nigerian, Somalis, Jews and whatever. Let us now again take up this question of “fairness,” and is it fair or is it not fair for one people to drive another out of their territory and occupy it for themselves ? As history has shown from time immemorial, this question is entirely moot. History has demonstrated repeatedly and irrevocably that territory is occupied by those people with the will and the means to conquer the territory they desire, and then held by those capable of, and determined to hold it. Is it fair ? Perhaps not, but history is not fair. Nature is not interested in fairness. The bigger fish eat the smaller fish, the coyotes eat the weaker rabbits and rodents, and on down the food chain. Is it fair ? Evidently Nature says it is, and there is only one Law of Nature that predominates in this regard, and that is the Law of Survival of our own species on this Planet Earth. Nature severely punishes with extinction those species that are too lazy, too laggard or too incompetent to take on the struggle for survival. The bottom line is : Eternal struggle is the price of survival. I didn’t make the rules but merely observe and learn from both the lessons of history and the laws of Nature. Having accepted the facts of life, I have no quarrel with reality. Nor is the moral question of survival of its own kind any problem with any of the races of mankind other than the White Race. In fact, they exalt and glorify their triumph over their enemies, whoever they might be. When one Indian tribe destroyed another they celebrated the extermination of their rivals with great gusto. The Old Testament is full of repeated glorification of how the Jews, with the help of their Jahweh god slew the enemy with the edge of their sword until every man, woman and child had been slain. Even the White Romans, Greeks and Egyptians stated massive celebrations over their victories throughout their history. The Romans shed no tears, felt no pangs of guilt when they finally conquered Carthage after more than a century of hostility. On the contrary, they burned Carthage to the ground and sowed salt in its ruins, and were damned glad they had destroyed an overwhelming threat to their survival. It was only after the Jews inflicted the New Testament brain scrambler on the Gentiles that the White Race was plagued with the so-called morality of guilt and “fairness.” We can specifically point to the Sermon on the Mount teachings of “love your enemy,” “turn the other cheek,” “sell all thou hast and give it to the poor” for the suicidal origin of this self-destructive idea. (See “The Sermon on the Mount,” page 154, A Revolution of Values. Having thrown all this perfidious and suicidal Jewish advice overboard and established a rational and realistic moral base for our own survival, we are now ready for its next step. 7) Ever since Columbus discovered America in 1492, the White Race pursued a vigorous programme of expansion and colonization, a healthy instinct Nature has imbued in all its creatures, whether they be animals, birds, insects or plants. This expansion was first led by the Spaniards and the Portuguese, then rivaled and surpassed by the French, the Dutch and the Anglo-Saxons. There was one major difference between the former and the latter groups. Whereas the Spanish and Portuguese poisoned their gene pool in the New World by interbreeding with the indigenous natives, the Anglo-Saxon group, by and large, did not. The result is (or was) the great country of the United States we once knew, and to the detriment of the Latinos, the mongrelized mix-breeds and mestizos of Mexico and South America. Be that as it may, this surge of energy by the White Race lasted for some 450 years, then came to an ignominious halt after the suicidal events of WW II. Not only did it come to halt, but through the Marshall Plan and the insane American policy of subsidizing all the scum, freeloaders and dark races of the world, we, the White Race are now in full retreat, running before our inferiors, apologizing for our previous success, and thanks to the devilish manipulations of the Jewish Kehilla, we, Nature’s Finest, are now on the road to extinction. Be it therefore resolved, we, the White Race are now determined to take Step No. 7, the final stage of building a Whiter and Brighter World. We are determined to take up where our White ancestors left off 50 or 100 years ago and resume the colonization programme of our illustrious forbearers and expand the domain and territory of our great Race. We now have the moral base on which to proceed, fully backed by our religion, supported by centuries and millenniums of history, and furthermore, by the Eternal Laws of Nature. We need nothing more. We will make one major change in our future expansion. Instead of conquering new territory and intermingling and exploiting the cheap labour of the natives, we will have none of this nonsense. Instead, by planned and deliberate measures, we will make a clean sweep, one measured addition at a time. In such territories as we colonize we will clear it of the dark races and settle it with White families exclusively. No longer will there be any of the former muddled geographic race mixing. We will settle and digest one segment of territory, then go on to the next, until such time as this beautiful planet will be settled and inhabited by its most deserving heirs, Nature’s Finest. Only through Creativity can we accomplish such a noble and far-reaching goal.